Corrects the color profile of a source RGB image to the color profile of a target RGB image. This function outputs target_matrix, source_matrix, and transformation_matrix and saves them to the output directory as .npz files. It also outputs, corrected_img, but storage (print or plot) is determined by debug mode. Important Note: Each image must contain a reference from which color values are sampled. The following example uses a 24-color Colorchecker passport. To see an example of how to create a grayscale mask of color chips see here. source_mask = cv2.imread("mask_img.png", -1) # in this case, as our images share a zoom level and colorchecker placement, the same mask is used for both the target and the source. Automatically detects a color card's location and size. Useful in pipelines where color card positioning isn't constant in all images. rgb_img = Input RGB image data containing a color card. df = Dataframe of all color card chips found. start_coord = Two-element tuple of the first chip mask starting x and y coordinate. Useful in create a color card mask function. spacing = Two-element tuple of the horizontal and vertical spacing between chip masks. Useful in create a color card mask function. Important Note: This function isn't entirely robust. There are a few important assumptions that must be met in order to automatically detect color cards: - There is only one color card in the image. 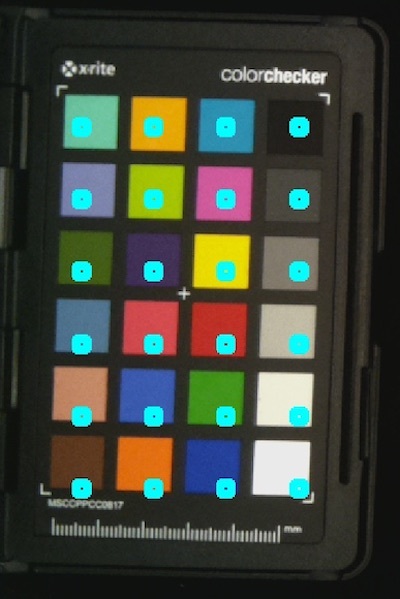 - Color card should be 4x6 (like an X-Rite ColorChecker Passport Photo). Spacing calculations are based on 4x6 color cards. Although starting coordinates will be robust for most color cards, unless an entire row or entire column of chips is missing. Missing chips may also skew spacing and can also skew starting coordinates. - Color card isn't tilted. The card can be vertical OR horizontal but if it is tilted there will errors in calculating spacing. Creates a uniquely labeled mask for each color chip based on user-defined positioning. radius = Radius of color masks.  start_coord = Two-element tuple of the first chip mask starting x and y coordinate. spacing = Two-element tuple of the horizontal and vertical spacing between chip masks. nrows = Number of chip rows. ncols = Number of chip columns. mask = Labeled mask of chips. The first chip is labeled with the value 0, then 10, 20, and so on. Computes the average R, G, B values for each region in the RGB image denoted by the gray-scale mask and saves them in a matrix of n x 4, where n = the number of color chips represented in the mask. mask = a gray-scale img with unique values for each segmented space, representing unique, discrete color chips. color_matrix = a n x 4 matrix containing the average red value, average green value, and average blue value for each color chip. Computes the Moore-Penrose Inverse Matrix, an important step in computing the homography for color correction. - target_matrix = a *n* x 4 matrix containing the average red value, average green value, and average blue value for each color chip. - source_matrix = a *n* x 4 matrix containing the average red value, average green value, and average blue value for each color chip. Computes the transformation matrix for application to a source image to transform it to the target color profile. 1-t_det = "deviance" the measure of how greatly the source image deviates from the target image's color space. Two images of the same color space should have a deviance of ~0. Applies the transformation matrix to an image. Save a matrix from to '.npz' file. Load a matrix from an '.npz' file. We have added a function to help identify problems with color chips. One frequent issue that can happen is a color chip that is fully saturated, and would be better off excluded from analysis . 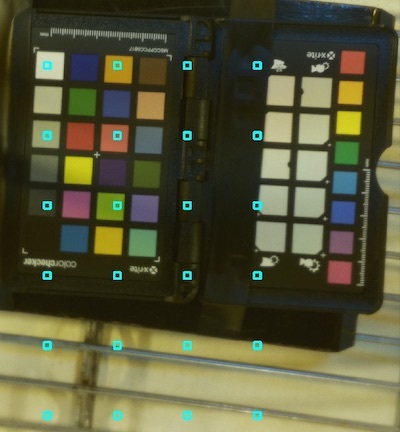 A quick way to examine this is by plotting the source matrix value against the target matrix value for all color chips masked in the color card. 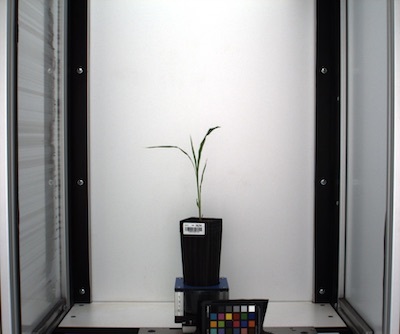 To see an example of how to check for problematic color chips see here.